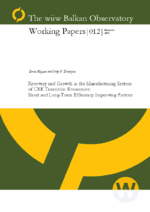 The first aim of the paper was to explain a cross-sector differences in evolution of gross product of Slovenian manufacturing sectors in the period 1992-98 using different short and long-term factors. Results pointed out great importance of initial conditions (sector orientation to convertible or non-convertible markets, and distorted production structure), as well as structural reforms and macroeconomic and institutional environment. Added long-term factors revealed positive association with short term output growth during the transition period – it is obvious that these factors (FDI, exports, imports of inputs, cooperation) create channels for the transfer of technology, improving the efficiency of production. It turned out also that quality improving exports to the EU countries is significantly positively correlated with the sector output performance. The paper further studies the importance of both direct and indirect means of technology transfer for transition countries and its impact on productivity growth of local firms. Using firm-level data for eight transition countries for the period 1994 - 1998 and employing growth accounting approach, the paper explores the importance of FDI, intra-industry knowledge spillovers from FDI, firm's own R&D accumulation and of international R&D spillovers through trade for firm's TFP growth. Time-invariant firmspecific effects are taken into account using panel data techniques, and potential selection bias for foreign investment decisions is corrected by using a generalized Heckman two-step procedure. After controlling for common economic policy influences and industry effects, our results confirm for five advanced transition countries that technology is being transferred to domestic firms primarily through direct foreign linkages. Evidence on some international R&D spillovers through arm-length trade has been found for four transition countries. Our results also suggest that FDI do not generate positive intra-industry spillovers for domestic firms. Moreover, for three transition countries FDI were found to have significant crowding-out effects for local firms in the same industry.